The Peacock Room in Blue and White fills the room’s shelving with blue-and-white Chinese porcelains, inspired by room’s appearance in 1876 when it was the dining room of Frederick Leyland, a shipping magnate in London. With the sinuous patterns and brilliant blue and white colors of Leyland’s Kangxi ware in mind, Whistler, a proponent of aesthetic harmony, painted over the room in a flurry of blue and gold. 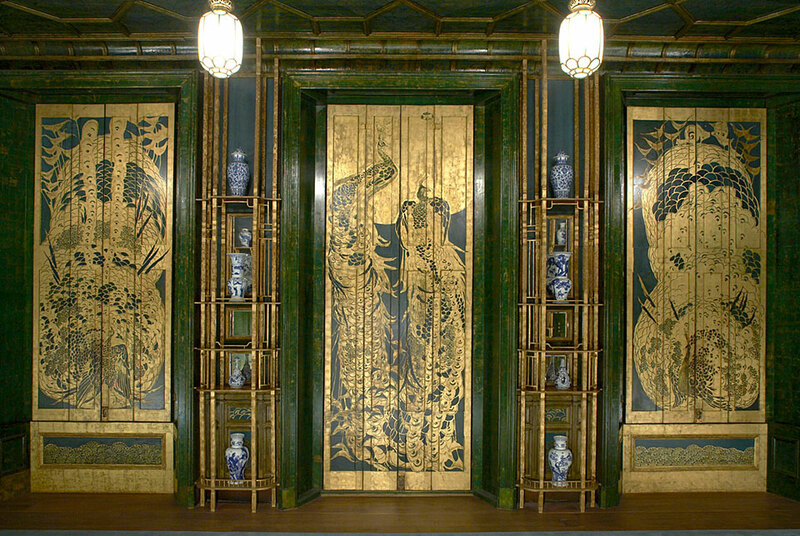 The intricate blue, green, and gold patterns invoke the plumage of the peacock, creating a tonal counterpoint to the bolder patterns and colors of the porcelains.